Invite your friends over instead of going out. It’s not hard to spend a lot of money when you go out to a restaurant or club. To save money invite them over to your house and have a potluck or cookout. You can play games and have a few drinks. If everyone brings a dish you can cut down on costs drastically and it won’t be long until people reciprocate and invite you to their house also. Don’t spend tons of money entertaining your kids. This is especially true for younger children. It doesn’t take a lot to entertain young children and most won’t remember the earlier years. Create simple games like taking rubber balls and having them try to throw them into a plastic bin. Play dolls or soldiers. What your children want most is the time you spend with them. Switch bank accounts. Your hard earned money shouldn’t be going to maintenance and service fees. Talk to your bank and see if they can switch you to an account with little or no fees or if necessary change banks. Take the time to turn off your television. By cutting down on the amount you watch television you can save on your bill and not be exposed to all the guilt induced ads about the new products out there. Instead of watching TV go outside, read a book, or visit a friend. Do price comparisons. Pay attention to the items you buy most frequently keep the receipts and shop for the same items at the other grocery stores around town. Then when you look at the receipts you can see where you can save the most money. Gisele Bundchen was born in Horizontina, Rio Grande do Sul, Brazil in 1980 and grew up in a household with 5 sisters. She was discovered by an elite agent well chowing down on a Big Mac at a McDonalds. In 1995 despite her fathers protest she moved to the city and entered the Elite Look Modeling Competition. In 1999 she appeared on the cover of Vogue and has since worked for campaigns like Ralph Lauren, Dolce and Gabbana, Versace, Valentino, Celine and many others. She has been romantically linked to Scott Barnhill, Joao-Paulo Diniz, Josh Harnett, and Leonardo DiCaprio. Giselle has signed a multimillion dollar contract with Apple Computers and made a guest appearance on The Devil Wears Prada. In 2007 she was named as the world’s top earning model and signed a contract with Procter and Gamble for Pantene Hair products. In 2009 she married Tom Brady and it was announced the two are expected their first child. Chop ribs into serving size pieces place them in a ziploc bag. Combine the rest of the ingredients together. Take half of the marinade and pour it over the ribs. Close bag and squeeze coating the ribs with the marinade. Refrigerate ribs and left over marinade anywhere from 7 hours to overnight. Take ribs out of marinade and place on rack over a greased baking pan. Cover and bake at 350 F for about an hour. Pour remaining marinade over ribs and bake uncovered for 30-45 minutes or until tender. Occasionally brushing the ribs with drippings. There is nothing wrong with paying for dates or buying gifts especially if you really like doing it. The problem is when the girl starts to expect it from you all the time and when she wants only expensive things. In today’s day and age it doesn’t hurt for the woman to pick up the bill every now and then. They want to be treated like equals then they should act like equals too. You find out that the girl you have been with has cheated on you . You go through the fighting and talking and work things out. Next thing you know your friends and family are telling you they see her hanging off random guys. If she cheats on you once it’s up to you if you want to forgive her. If she cheats on you again then you don’t need to make the mistake of forgiving her again. These girls are worse then gold diggers. Gold diggers take your money but you can get that back with hard work and time. Baggage girls are so depressed that they will pull you down with them until you feel as miserable as them if not worse. These girls have too many issues and until they sort them out they should not even attempt to be in a relationship with anyone. These girls won’t even break a sweat. They go to the nail and hair salon every other week. They don’t do any cleaning. They expect you to carry them over puddles or make it stop raining. All that these girls want is to sit around and be pampered. Not to mention they think they are better then everyone and totally self absorbed. If she is willing to try and fit into your world and comprise then by all means date her but if she’s not going to sacrifice some things then kick her to the curb. She finds reasons to pick fights and she enjoys fighting with you. Her total goal in life is to make you miserable and show you that shes right and you’re wrong. Guilt is her weapon of choice. One thing to look out for is negativity. On your first date if anything negative comes out of her mouth about you then get out while you can. Quagmire: Fat chicks need love too…. they just need to pay! Lois: Oh, I haven’t been on a college campus in years. Everything seems so different. Stewie: Really? Perhaps if you laid on your back with your ankles behind your ears that would ring a few bells. Chris: Dad what’s a blowhole for? Peter: I’ll tell you what it’s not for, son. And when I do you’ll understand why I can never go back to Sea World. Bonnie: Somebody save him, he can’t swim! Peter: Oh, he’s not even kicking. Kick Joe, kick! Lois: Peter, he’s a paraplegic! Peter: That doesn’t mean he can’t hear. Kick Joe, kick! Stewie: Flag Girl? Ummm, yes good for you… Now you can be somewhere else when the boys don’t call! In Oklahoma it is illegal to have the hind legs of a farm animal in your boots. In New Jersey it is illegal to wear a bullet proof vest while committing a murder. In Idaho bicycles are not allowed on tennis courts. In Delaware getting married on a dare is grounds for an annulment. In Minnesota all men riding motorcycles must wear shirts. Take a long look at your collections. Most people have something in their house they collect. Look around do you really need all those model cars or comics or whatever it is you may collect. Does it consistently bring you joy or is it more of a habit now. Look at items and get rid of duplicates or the items you no longer use. You can bring it some extra cash by getting rid of them. You can also save money in the long run and have more space. Buy video games with replay value. Don’t just run out and buy the newest game out there just because you feel like. Instead focus on buying games that will give you playing time. Look for puzzle games or even long quest games. Then play that game until you master it. Once you do then consider looking for a new game. Make big batches of food to store in the freezer. Maybe you don’t have to work for a few days so use that time to your advantage. Prepare big batches of chilli, stew, casseroles etc. Then not only will you have dinner for that night you can freeze what you aren’t going to eat and on a day when your family is more pressed for time you can heat the food up in the oven. Install LED lights. When you first switch it’s going to be a little expensive but LED not only save money on your bill they last longer then regular light bulbs. Place LED lights in suitable areas since they are dimmer. Then use incandescent lights in areas where you read or do puzzles until the LEDs get better. Install a programmable thermostat. This will regulate the temperature in your house by the schedule you set. You can make sure the heat comes on at night when everyone is home or you notice its chillier outside and you can set it so it turns off when the house is empty. This can easily cut an energy bill 10-20%. The Kitchen Gadget Every Man Needs. I bet you are thinking that this gadget is something unheard of or expensive. Well you couldn’t be more wrong. This gadget is something many people already have. It’s great for those who have a busy schedule who don’t want to always spend money on takeout. It’s also good for those who don’t like to slave over the stove which is what makes it good for many men. What is it? A crock pot! Out of all the kitchen gadgets we have bought over the years I think it’s the best one. You can get a good quality crock pot between 50 and 100 dollars making it affordable for anyone to buy. You can make everything from main courses to desserts in your crock pot. You can put something on before you go to work and have a warm supper waiting for you when you get home. One of the things I notice is I am a lot more comfortable leaving the crock pot on all day then leaving the oven on. Be sure to look out for some delicious crock pot recipes. How Crock Pots Abridge Your Frantic Life? 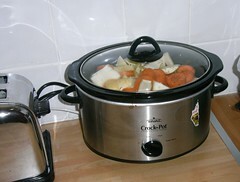 Posted byDave January 18, 2009 January 31, 2009 Posted inFood and DrinkTags: Cooking, Crock pots, Gadget1 Comment on The Kitchen Gadget Every Man Needs. Victoria Beckham was born in Hertfordshire England in 1974. Her parents ran a successful electrical wholesale business and were well off. Victoria however was lonely she was often teased because of her acne and would ask her father not to drop her off in front of the school so she wouldn’t be seen in the families Rolls-Royce. She joined a band while she was in school and also did some dancing and modeling. Her original band didn’t work but Victoria decided to try out for an ad she saw in the paper looking for five girls who could sing and dance. In 1996 the Spice Girls debut album “Spice” was released and it was a hit across the world. Their success was short lived when Geri Halliwell decided to split from the group in 1998. The four remaining Spice Girls released an album which was met with a lukewarm response and the girls decided to split up and try out solo careers. In 1991 Victoria Adams married soccer star David Bechkam and together they had 3 sons. Victoria released an Autobiography even though she has admitted to not reading a book from cover to cover. In 2001 she released a solo album but it was clobbered by the release of Kylie Minogue’s comeback single. In 2004 Victoria created a fashion line which consisted mainly of high-end jeans. She then came out with an eyewear line and his and her fragrances. 2007 Victoria and her band mates did a reunion tour at the Victoria’s Secret Fashion show and she also made some guest appearances on the TV show Ugly Betty.